This interesting plant belongs to that remarkable family of orchids (Orchidaceae) which includes over four hundred genera and five thousand species. They are especially noted for the great variety of shapes and colors of their flowers, many of them resembling beetles and other insects, monkey, snake, and lizard heads, as well as helmets and slippers, the latter giving rise to the name of the plant in our illustration. The variety, singular beauty, and delicate odor, as well as the peculiar arrangement of the parts of the flower, make many of the species of great financial value. This is also enhanced by the extreme care required in their cultivation, which must be accomplished in hothouses, for the majority of the more valuable forms are native only in the tropical forests. Many, too, are rarely found except as single individuals, widely separated. There are many parasitic species, and in the tropics a larger number attach themselves by their long roots to trees, but do not obtain their nourishment from them, while those belonging to temperate regions usually grow on the ground. In the last sixty years the cultivation of orchids has become a passion in Europe and, to a great extent, in America. 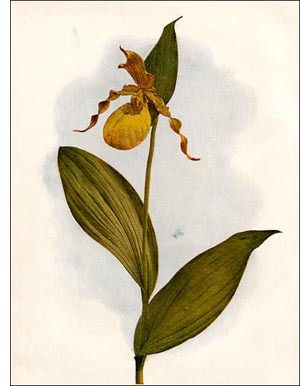 It is said that " Linnaeus, in the middle of the last century, knew but a dozen exotic orchids." To-day over three thousand are known to English and American horticulturists. Though admired by all, the orchids are especially interesting to the scientist, for in their peculiar flowers is found an unusual arrangement to bring about cross-fertilization, so necessary to the best development of plant life.